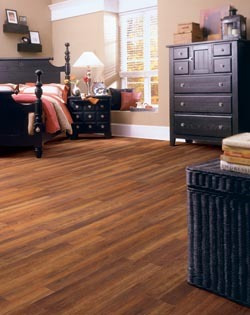 Do you want to have the look of hardwood flooring throughout your home without the high price tag? Whether you prefer the classic, elegant look of hickory or you want a stylish whitewashed look of birch, we have laminate flooring to match your preferences. Give your home a style upgrade without overpaying by investing in new laminate flooring for your space. Our selections don't stop at laminate. If you're looking for other affordable options, then browse through out luxury vinyl flooring. Why Do Customers Choose Laminate Tile Flooring? Our showroom is stocked with laminate wood flooring styles that look just like hardwood. We keep a well-organized selection of styles so customers may browse at their leisure. Our sales experts want every person that walks through our doors to find the right choice for their budget and décor. Even if it takes an hour or more, we stick with you until you are certain about your purchasing decision. With service in mind, we proudly extend a free in-home consultation to any current or potential customer. A design expert comes to your home and helps you select the right option for your home’s décor, your natural light, and your budget. Once you see samples in your space, making a purchase with confidence may become easier for you. Don’t wait around when our team of professionals can install your new flooring quickly and correctly. We are capable of getting the job done with minimal disruption to your daily routine. Our installers make sure your possessions are safe, not damaged, and returned to their original place after the service. Once your laminate flooring installation is complete, the service is backed by our lifetime guarantee. Any installation-related problems that may come about during the lifetime of your flooring are all corrected at our expense. Trust us to follow through with our installation service and back it up with a lifetime guarantee. Contact us today to schedule your laminate flooring installation with out professionals. We proudly serve clients throughout Jackson, Jackson Hole, and Wilson, WY, and the surrounding areas.